A multi-trigger element (MTE) is a control element that can send fire commands out of multiple output ports. Fire Button: The play button in the upper lefthand corner (expanded) will fire the current trigger. 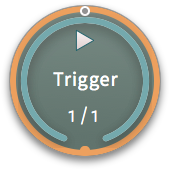 Current Trigger: The currently queued trigger, which will be fired when the play button is hit or the element recieves a fire command. See Initial Multi-Trigger Element for Canvas Firing. Total Triggers: The total number of output ports on the element. (Min 1, Max 100). Fire Options: The fire options allows you to set the way a MTE fires. Fire Sequentially: Fires the current queued port and goes to the next trigger. (Wraps back to 1 when finished). Fire All: Fires all the ports at the same time. This still tracks the current queued trigger sequentially. Fire Random: Fires a random port. This still tracks the current queued trigger sequentially. BPM Check Box: Enable/Disable BPM Trigger. See BPM Trigger for more. BPM Tempo: Sets the current tempo for the BPM Trigger to fire. See BPM Trigger for more. BPM Beats: Sets the number of beats in a bar. See BPM Trigger for more.